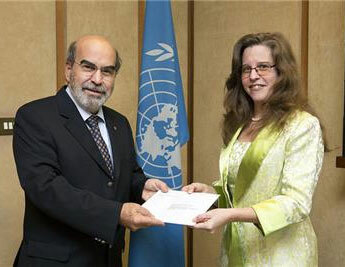 The Cuban Ambassador to the United Nations agencies in Rome, Alba Soto Pimentel, has formally presented FAO Director-General José Graziano da Silva with Cuba's instrument of accession to the Agreement on Port State Measures to Prevent, Deter and Eliminate Illegal, Unreported and Unregulated Fishing, reports NaijaAgroNet. Ambassador Soto Pimentel said Cuba's accession to this international treaty is a sign of the political will of the Government of Cuba to contribute in an effective and concrete way in support of measures for the protection and sustainability of ecosystems and the preservation of marine biodiversity. For his part, the FAO Director-General, Graziano da Silva, strongly welcomed Cuba's accession, saying "I am sure it is an example which will be followed by many other countries in the Caribbean region." The Agreement, NaijaAgroNet gathered will create binding obligations, comes into force when 25 countries or regional economic blocs have deposited their instrument of adherence with the FAO Director-General. With Cuba's adherence 23 countries and the European Union, on behalf of its members, have deposited 24 instruments of adherence. Among the latest are Barbados, Guyana, Republic of Korea, South Africa and the United States. NaijaAgroNet gathered that Illicit fishing, which includes operating without authorization, harvesting protected species, using outlawed fishing gear and violating quota limits, may account for up to 26 million tonnes a year, or more than 15 percent, of the world's total annual capture fisheries output. Pix: (r) Cuban Ambassador to the United Nations agencies in Rome, Alba Soto Pimentel, presenting FAO Director-General José Graziano da Silva with Cuba's instrument of accession to the Agreement on Port State Measures to Prevent, Deter and Eliminate Illegal, Unreported and Unregulated Fishing, recently.